I read this during an impulsive YA weekend romance binge, which is a bit unusual for me but was fun. And I think that sums up my general feeling toward this book: it was light, adorable fun. So our main characters, Lucy and Owen, meet in an elevator (LIFT) during a city-wide blackout. Lucy is a private school girl from, I’m going to assume, a pretty rich background and Owen, in stark contrast, has just moved to the city with his grieving father after his mother’s death. Stuck in an elevator until they’re rescued, the two share a fairly magical night under extraordinary circumstances. 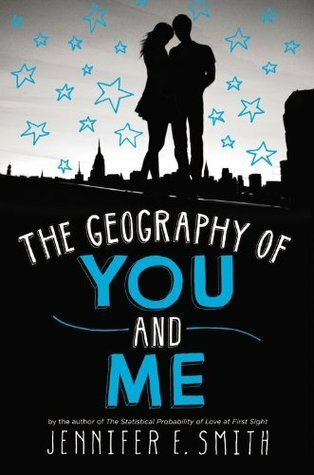 The connection they share with each other reaches out across continents and oceans as the two live their lives – Lucy moves to Scotland and then England while Owen and his father road trip across America. They send each other postcards and emails, dancing around their feelings for each other (they want to make out with each other so bad) but like Meg Ryan and Tom Hanks in every movie they’ve ever been in together, Owen and Lucy find their way back to each other each time. I enjoyed this book for a lot of different reasons, I think. Owen and Lucy were both sympathetic, developed characters and they don’t spend their time pining for each other. I love that. Yeah, they miss each other and both feel like no-one matches up but that doesn’t stop either of them from living their lives. It’s not very often in a romance that both characters get into relationships with other people and grow as a result so it was a nice development. I also liked that these two characters were quite mature in their outlook on life – Lucy’s parents uproot her life in New York to move to Scotland but despite this Lucy doesn’t react badly. She embraces the change and appreciates that not everyone is as lucky as she is. Owen seriously considers not going to college for a year so that he can stay with his grieving father and I have to say that I really liked that. I generally dislike the characterisation of teenagers as selfish because in my experience it’s just not true so points go to Smith for writing teenagers that felt real. Also. The romance, you guys. I’m so weak, I love the romance of serendipity. Meetings between people who would never meet under ordinary circumstances fill me with the warm and fuzzies and I swear, I will blame Disney for this until the day I die. Lucy and Owen meeting and then going on to not forget about each other despite everything going on their lives – PLEASE. I was not meant for these emotions, okay. And the postcards and meetings and angst, nope, nope, nope. The best thing a romance can do, I think, is make you want the two characters to end up together and I really did want Lucy and Owen to be together. And make out a lot. I mean what. “I’m so weak, I love the romance of serendipity.” Hahah, I am with you! I can’t wait to read this book, it sounds like a great read! Nice review! This sounds like it will be a lovely book! Might have to track it down! it’s adorable, i was pleasantly surprised!